Filing of tax returns and tax payments has been made easier and convenient for taxpayers through the BIR eFPS or eFiling and Payment System. BIR eFPS is a system that has been developed and maintained by the Bureau of Internal Revenue (BIR) for electronically filing tax returns and paying taxes ONLINE or through the internet. With BIR eFPS, taxpayers can avail of a paperless tax filing experience. They can also pay their taxes online through the convenience of an internet-banking service via debit from their enrolled bank account. Since ePFS is accessible online, taxpayers can file and pay for their taxes 24/7 and wherever your are as long as you’re using a computer with an internet connection. Aside from the convenience that this system offers, the BIR eFPS also provides a much faster processing and immediate confirmation of tax returns filed and paid. You must be registered with BIR-Integrated Tax System. You must submit a Certification from the President of the corporation authorizing 2 officers to file return and to enroll for availment of the eFPS, and a Letter of Intent to avail of eFPS. You must enroll in eFPS. You must enroll with any eFPS-Authorized Agent Bank (eFPS-AAB) for use of their e-payment system. Using your computer (or smartphone or tablet) with internet connection, access the BIR website by typing www.bir.gov.ph on your internet browser (Internet Explorer, Google Chrome, Mozilla Firefox, or Safari). Enter an active Email Address. Enter the Verification Code and Captcha code to complete the enrollment. However, if you see this warning message below, it means that your TIN is not yet pre-loaded in the BIR eFPS Registration database. Pre-loading of TIN is one of the pre-requisites in the eFPS availment. If this is the case, you must coordinate with your RDO (Revenue District Office) by submitting a Letter of Intent. Once done, you may fill-up the enrollment form again. You will receive an email notification from BIR and you have to print it. Then, submit all the necessary documents to the respective RDO who has jurisdiction for your account activation. You will receive an email notification regarding the status of your application within 3-10 working days. Once your account has been activated, you may now start filing your tax returns online. You may also be required to maintain an online banking facility with any authorized agent bank (AAB) where you intend to pay through the bank auto-debit system. Make sure to keep your login information and account details in a safe place to avoid any issues in the future. eBIR Form 1602 Monthly Remittance Return of Final Income Taxes Withheld On Interest Paid On Deposits and Yield On Deposit Subtitutes, Trust, etc. Who is eligible to use the BIR eFPS? Taxpayers who need to file and pay their taxes to the Philippine government are eligible to use the system. Is there a fee when using the BIR eFPS? No. You can enroll and use the ePFS for FREE. Is it safe and secure to use the BIR eFPS? Yes. Certain security features have been encrypted and embedded on the BIR system to make sure that all the data and information are safe and secured. If the user is no longer authorized to transact with eFPS in behalf of the company or he has already resigned, the taxpayer must submit a Board Resolution or a similar written request to BIR for the revocation of access of a deactivated user. The same written request should indicate the name of the newly authorized user. Once the deactivation request has been processed by BIR, the Taxpayer can now enroll the newly authorized user thru the ‘Enroll More Users’ facility of eFPS. Can I change my password in eFPS? Yes. You are encouraged to change your password regularly for security purposes. Go to the eFPS Site and click the ‘Forgot Password’ link. You need to supply your TIN, Branch Code, Username and Answer to the Challenge Question. An email will be sent to your registered email address with a system generated password. What if I forgot the answer to the Challenge Question, what shall I do? Upon activation, the user may login in eFPS using the new login credentials supplied during enrollment. Can I enroll more than once? No, you can only enroll once per company. However, once the initial user is activated, additional users can be enrolled using the Enroll More Users facility on eFPS. Taxpayers may have as much as 3 user accounts for a single TIN. Why was my enrollment to eFPS rejected or disapproved? It could be that the Information provided in the enrollment form does not match with the documents submitted and/or registration data stored in BIR database. Maybe the Person enrolled is not authorized by the President of the Corporation/Head of Office. Or, the taxpayer was found to be bogus upon investigation. 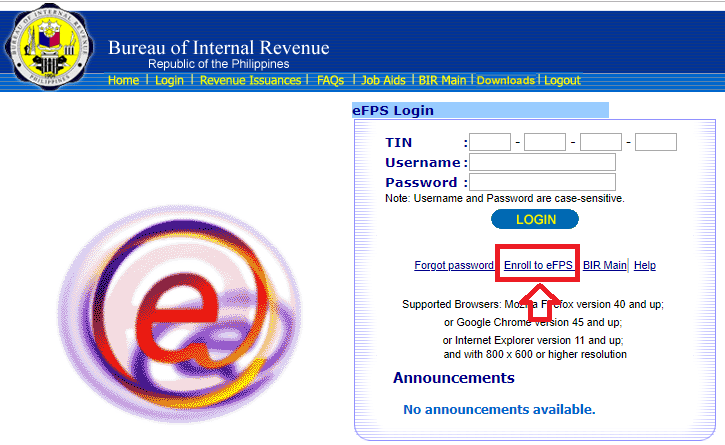 I can’t login or file my taxes online through eFPS, what shall I do? You may file your tax returns manually if there is a system maintenance or technical error with the eFPS. Is there a reference number when I file my tax returns online? Yes. A system generated Filing reference number or FRN is issued for every successful filing transaction. For more info and FAQs about BIR eFPS, click here.